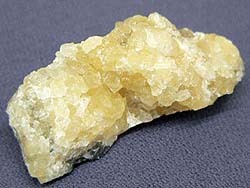 of witherite from Falloufilda, Nortemberlend (Great Britain). Witherite is a carbonate of barium. Glance (glitter, glare) dim, glassy. Transparent to translucent. Colors: white, grey, rather yellow. A line is white. Fracture, break uneven. Fragile. Cleavage perfect absolute. In the sprinkle of snow very poisonous !! Rare. Crystals (rhombic Crystal structure) of bipyramidal. Be found also as radiant spherulites, fibred, burl oolitic-like (any sedimentary rock, esp limestone, consisting of tiny spherical concentric grains within a fine matrix, shallow spherical mineral formation, the center of which are fossil tailings of animals and plants, mineral wreckages or gas bubbles) and dense downlow aggregates. Widespread in England, USA. 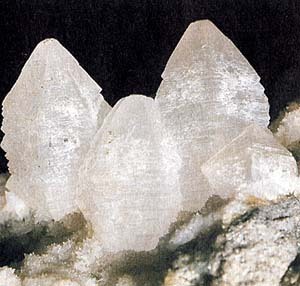 A white, grey, or yellowish mineral consisting of barium carbonate in orthorhombic crystalline form: occurs in veins of lead ore.
Witherite is crystallized as paired twin (duplex) individuals (with shading, parallel bottom base) or short-prismatic and plate tablet lamellar crystals. Much more frequent there are fibred, mammiform and grainy the masses. Cleavage perfect absolute, parallel bottom base of prism. Colors various: from colourless to white or grey, sometimes is inconspicuous-yellow, green or light-brown. Colors in powder triturate always white. A mineral is transparent or examines with x-rays; brilliance from glass to resin. Under act of ultraviolet rays Witherite fluorescent, acquiring the white-blue style. Dissolves in muriatic and nitric acids with boiling up. Due to the presence of barium paints flame of gas-ring of Bunzena in a yellowish-green color. Fuse melt easily, painting flame in a green color. A behavior is in acids. Dissolves (with hissing) in dilute acids. Be found in vein, lode, mine hydrothermal deposits as low temperature mineral. In an association with Fluorite and Calcite found out the large crystals of witherite in the state Illinois and other districts of the United States of America (USA). Deposit minefield mine field occurrence subsoil of industrial scale is present in England near-by cities Kamberlend and Darkhem in of the same name counties; the aggregates of magnificent crystals are there found. Dense the masses of this mineral are exposed in Portal (state of Californium, USA) and in Siberia. 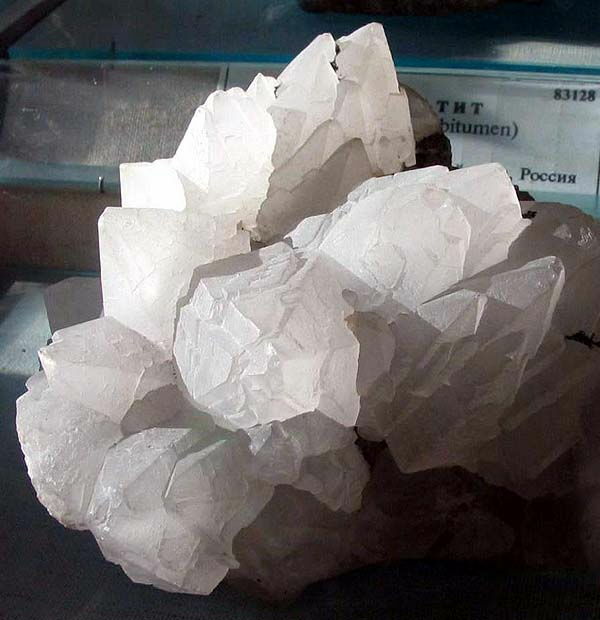 Witherite is used as руда on a barium and for making of the special glasses. Witherite. Alston-Mur (Olston-Mur), Kambriya, England, Great Britain. A photo: © A.A. Evseev.